Property24.com, South Africa’s largest property portal owned by Naspers, has bought rival Private Property. The deal is likely to come under the close scrutiny of competition authorities as it involves the two biggest property portals in the country. Due to the impact of such an acquisition on the industry, Entegral was interested to find out what the perceived advantages and disadvantages of such a deal would be, both through the eyes of the consumer and the estate agent. Here are the results from around 250 responses received on a survey done over a 2 day period, mostly from agents and agency owners. While the survey presents a small portion of the market (according to the EAAB's latest annual report there are 19,424 registered agents and agency owners, excluding intern estate agents, in South Africa), feedback has been received from well-respected agency owners and agents, and we believe this gives a good indication of the current view of agents. The fear from estate agents is that a complete monopoly will be created if the deal goes through and that they will be held ransom to an increase in prices. This is clearly something that Property24 will need to address with the industry. What do estate agents think? 3/4 of estate agents surveyed believe the acquisition will be bad for the real estate industry, and that something needs to be done. 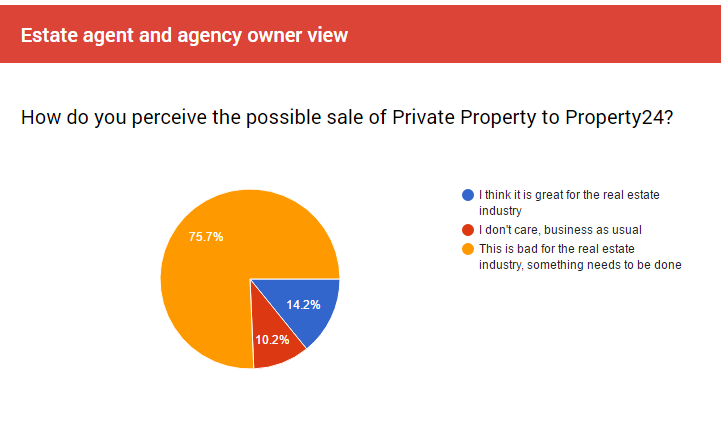 71% of estate agents believe that the industry needs an agent owned portal, while almost a 3rd believe current portals do a great job, and don't see value in getting an industry owned portal in place. When queried on the pricing models offered by property portals, 61% believe they are overpriced with the rest indicating that prices are fair or provide very good value for money. This is bad for the industry, typical move by big corporations to buy up the competition, take full control the market and push prices as high as they like. All this while the agents secure the mandates, do all the hard work and get charged a premium to load OUR stock onto their portal. It won't be long before they start charging us for leads! Let's hope the competitions board stops this madness. Private Property and Property 24 are the two major and most effective property portals on which to advertise available property listings. As an obvious consequence of the removal / neutralization of one of these major players by Naspers, this merger will most definitely have an adverse effect on competition between property portals. Estate agents will henceforth be at the mercy of the huge Naspers Group when it comes to the marketing of their sellers' properties. As costs are increased by Property 24 at their own discretion and without any real competition, estate agents will have to pass these increases on to their clients. Estate agents and consumers will be negatively affected. In fact, it seems that this merger is only in the interest of the shareholders of Property 24 and Private Property. Creating a serious monopoly. In my opinion the industry should not support this at all. We have given them the power and it's costing us big money. Property24 is way too expensive and with the monopoly now, they won't consider the cost for the estate agencies. This will create a monopoly wrt real estate portal advertising in SA. They will dictate the price & terms of advertising. Estate agents will have to abide by their conditions with no other viable/similar offering. As long as Property24 is able to continue providing the leads (99% in my case). Prices will increase for agent and may even be passed on to the consumer by the agent . This will create a monopoly where industry is forced, based on a lack of competition, to pay for the services of P24 for the benefit of the consumer. The consumer always pays in the end. the last question in this survey is misleading - currently prices are fair because we have 2 very good players, if only one exists then prices will probably be increased and be unfair even though technological pricing should be coming down. I've always preferred P24 over Private prop - I get more leads from P24, so clearly you guys are doing something right, this can only be a good thing for us! One central control will be excellent because lesser problems wrt feeds, duplicates will occur. Property24 gives us more leads than Private Property and one operational webaite combined will be much better to pull all customers to one portal. With only one player in the online advertising space it will leave the industry in a terrible position with regards to advertising competition and pricing. One company will be in control. Depends....... how does this affect my pocket? Property24 will have the monopoly and charge agencies what they want. Property24 is already a useless website, most of my hits come from Private Property. This is a disaster! Creating monopoly where price fixing can take place!! Property24 becomes unaffordable for the smaller groups and with them taking over Private Property, our small groups is left with only our own websites re marketing. Monopoly in any industry is bad news to the consumer. Companies with financial backing should not be allowed to have monopoly of the market. Too much power is unhealthy! Will create a monopoly where they will control costs and data basis. Pricing by property 24 is already high. When they have the monopoly who knows what will happen. P24 is already billing us for leads that we never get. Pvt property will be managed the same way. They are exploiting our industry. The customer service of property 24 is basically non existent. Private property have really sharpened their game and if p24 is buying private prop then the same standards and hassles will filter through to daily office problems. I do not enjoy any of these two, but simply have no choice but to use their portals to show sellers that I give wide exposure to their properties. Whether they continue as one or two businesses, I will still feel forced to advertise with them. In my opinion neither show any consideration for the real needs of their clients. No-one bothered to inform their clients of this transaction nor did they take the time to discuss any of the consequences. I feel ambushed, uncertain and annoyed! By minimizing the number of advertising portals you are essentially enhancing the effectiveness of the remaining ones. Reducing duplicate postings and streamlining the consumers search. They will have a monopoly and will take advantage and increase prices significantly. We as estate agents provide a service to our clients and we use these portals to market our clients property. It keeps the standard in the industry high as we compete to make sure we always offer a better service. If there is only one portal they can price there slots and basically do whatever they want. If we only ever had one beverage company - can you imagine what we would be paying? And we wouldn't have a choice! It's bad enough with Telkom and Eskom - competition ensures standards are kept high and companies are always striving to be better. No competition- then there is no "why" anymore no drive to be better. A good idea, as we pay a fortune to advertise on both portals. Serious effects on the competition levels in the portal industry - will undoubtedly lead to huge increase in pricing by P24. Don't think a monopoly is good for any industry. Competition will improve the quality the pricing and the service. We want fair competition to protect the sellers property on a wider marketing spread! Price and advertising regulations ? Like any business there should be competition otherwise they will be able to do whatever they want. If will further affect real estate agents in terms of potential job loss. Something South Africa does not need! There needs to be a strong alternative to Property 24. We need competitive portals, else we are going to pay for no good services.